Oregon Bison and Buffalo Hunts | Bow & Rifle Hunting. If you're a Oregon big game hunter with any kind of real hunting experience, you've probably tried your hands at many different kinds of game. If you live in Oregon there are many areas where hunters can enjoy hunting beautiful animals. Unfortunately, what Oregon doesn't offer is many hunts where big game hunters can hunt America's largest game animal on public lands. As discouraging the lack of Oregon buffalo hunts might be to you in your quest to bag a buffalo, it doesn't have to be the end of the world. So what should you do if you're determined to hunt a bison or buffalo? The first thing you'll need to do is look outside of Oregon and be willing to travel to attain your dream hunt. We have been in business for over fifteen years, and during that time we have perfected the art of hunting buffalo. We offer buffalo hunts year round and allow buffalo hunters to visit our ranch and hunt their own buffalo, an experience you will never forget. 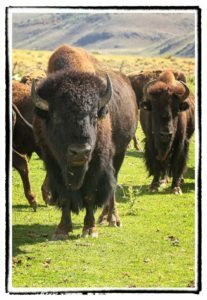 You're invited to look through information about our buffalo hunts or look through our frequently asked questions if you would like to know how you can make your buffalo hunt a reality, today. Get in contact with us if you have additional questions you can't find answers to on the website or give us a call.